Since August, I had been dreading the holidays. Football gave me an out at Thanksgiving; turkey at the tailgate spared me from the family table with the empty chair. But Christmas? There was no getting around her absence, no avoiding the void. Not that I didn't try. There were days when I was tempted to just skip Christmas, to bypass the usual decorations and celebrations, but how could I do that? Mom loved holidays, so how would ignoring Christmas honor her? And how would that be any less painful? So we forged ahead. The trees went up and tears were shed as the special McCoy ornaments were hung. My Granny's decorations—the singing choirboys, the tiny angels—were moved to a little corner of our living room so they could watch over our old stockings. 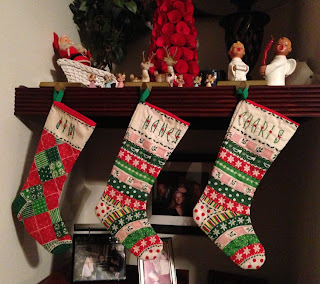 It'd been 20 years since the Jim, Nancy and Charis stockings had been displayed, but this year, I needed to see them in my home. Granny embroidered our names on those stockings, made from preprinted panels from the fabric store, back when I was in elementary school. Daddy died in '93, so when Brett joined our family in '94, Mom had the excuse she needed to get new stockings for us. Socks for Ryan and Katie soon followed. When we moved Mom to a retirement center last year, most of her Christmas boxes moved in with us. It wasn't until recently that I dug through those bins to find the items that screamed "McCoy Christmas": the felt ornaments Mama and Daddy made when they were newlyweds, the 1960s Santa Claus board book I pored over and gnawed on as a baby, the cowboy Santas Mom so loved, and these stockings. There's just something reassuring about seeing them in my living room, something about seeing our names together. It's a reminder of those days when we three were inseparable, and it reminds me of all those Christmases we celebrated in Austin, Premont and Tyler, especially the ones on Miller Drive. So hanging the stockings was one of my coping mechanisms, one way to acknowledge Christmases past. But what about the present? Our most recent tradition had been to invite the family over for Christmas Eve dinner and then have Mom spend the night so she could be with us on Christmas morning. She would sleep in her old recliner (which is now in our living room) so she'd have a front row seat to all the early morning festivities. After stockings and presents, Brett and I would cook dinner while Memaw hung out with Ryan and Katie. Since August, I had been dreading that empty recliner and even the whole Christmas Day cooking extravaganza. After cooking for five all these years, I was beyond sad to imagine only four of us around that dining table. We still had our Christmas Eve dinner, which was extra special with our precious great nieces and nephew in attendance. Those sweethearts filled our home with laughter, and boy, did we need it! And I still cooked a few dishes for Christmas dinner, making our traditional broccoli-rice casserole and mashed potatoes. But fortunately, we were able to eat lunch with Brett's family at his sister's house. It was perfect timing for a change of scenery. My mom loved, loved, loved snow. As the rest of North Texas cheered our white Christmas, I was bitter. Our last white Christmas was a painful one. Why did it have to snow this year, too? Fortunately, my cynicism was no match for those flakes. It was beautiful, and seeing pictures of our family's youngest members in the snow melted my anger. So that's how I navigated Christmas past and Christmas present. But there was still the present—as in gift—to contend with. Throughout the holiday shopping season, I kept feeling like I was forgetting something. I had my list, and even after finding gifts for Ryan, Katie, Brett and our family exchange, I felt incomplete. Of course, one glimpse of teddy bear figurines, UT ornaments or snowmen explained the feeling. I couldn't shake the need to buy my mom a Christmas present. 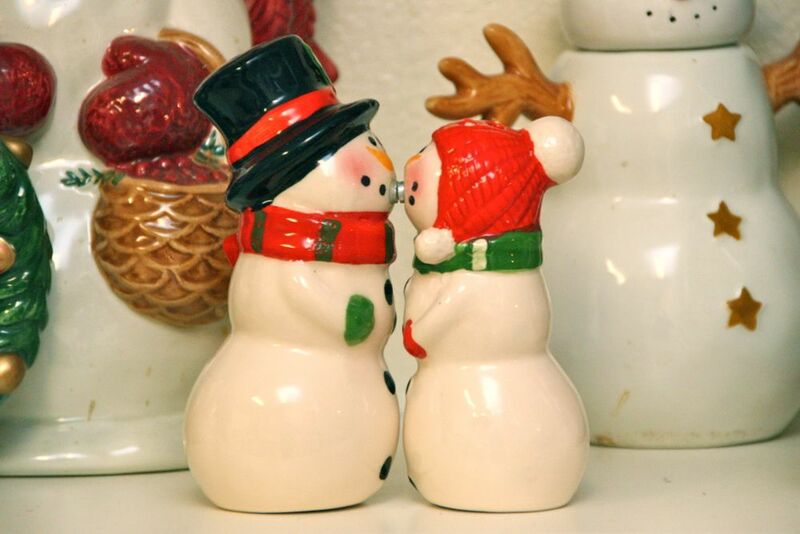 When I saw these salt and pepper shakers at Kirkland's, I knew they'd be coming home with me. Because of my mom's clutter-filled apartment, years ago I had started giving her small items for Christmas and her birthday; there was simply no room for larger items! I also tended to stick to seasonal gifts that could go in a box soon after the holidays. 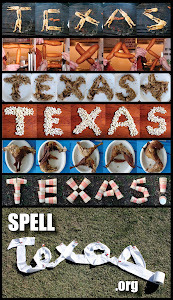 Considering her love of snowmen, not to mention teddy bears and the Longhorns, she was pretty easy to buy for! She always loved 'em! Hobby Lobby and the local Hallmark store were my go-to shopping haunts for Boyd's Bears and other little ceramic knickknacks. (That Hallmark store went out of business late last year. Coincidence?) Mom would ooh and aah over those little figurines for days, they didn't take up much space, and there was a place for them in her curio cabinets or entertainment center. Win-win-win. When picking out the figures, though, I was always careful to avoid anything that would remind her of Daddy. I didn't want something that mocked our loss: no grandpas, no cute husbands and wives, no daddies. This year, though, that rule did not apply. This year, for the first Christmas since 1992, there was nothing to separate my parents. But this year, for the first time in my 44 years, I had to survive Christmas without either of them. Survive, we did. Now that we're a few weeks out, though, it dawns on me that there is no prize for getting through the holidays. My reward? Knowing I get to "do Christmas" without my folks every year for the rest of my life. Plus, Mom celebrated ALL holidays with door decorations and festive earrings (You mean everyone doesn't wear leprechaun earrings? ), so I'm sure each occasion, each season will remind me of her just as much as Christmas does. Who am I kidding? EVERYTHING reminds me of her. Forget special events; even the everyday has a way of sneaking up on me and throwing me into a pit of grief. Mom had such an impact on me and many others. Of COURSE I see her in so many things! You know what would be really sad? If I DIDN'T miss her. I'm so, so thankful for all the wonderful Christmases I shared with Mom and Daddy, and I pray that as my little family makes new holiday memories, I'll never forget the smiles, the laughter, the love that my parents left as their legacy, their everlasting Christmas gift to all of us.